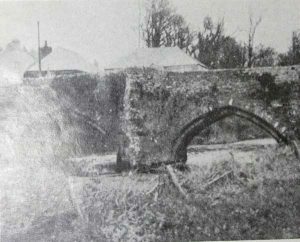 Yeolmbridge, dating from around 1350, is thought to be the oldest surviving — and is considered the most perfectly finished — of all the ancient Cornish bridges. It was also described as Cornwall’s “most ambitious” by Sir Nikolaus Pevsner. Although there are no records to tell us who built the bridge, it is assumed that with the adjacent Manor of Werrington belonging to the Abbots of Tavistock, that it was they whom would have had it built. With the River Attery for much of its length being for centuries the line of the Devon and Cornwall border, Yeolmbridge took the traveler from Cornwall into Devon on his journey from Launceston towards Stratton. The main structure is of dressed stone, although the parapets have been rebuilt in random rubble with stone on the edge copings. It features two pointed arches of 5.6m span, with a cutwater into the river and a refuge on the central pier. The carriageway was originally 3.5m in wide but the bridge was widened in 1877. It was the only bridge in Cornwall to feature stone ribs in the vaults underneath. Yeolmbridge is Grade I listed and a Scheduled Ancient Monument. The bridge gives its name to the small hamlet that sits either side of it.